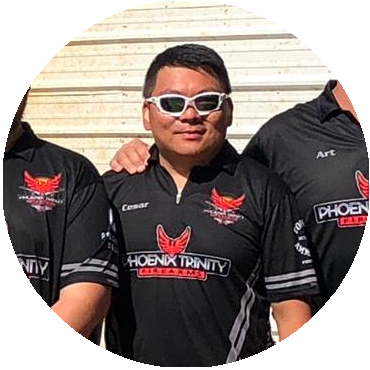 Cesar has been a member of Phoenix Trinity since 2014, which is the same year he started shooting professionally. He has competed in between 120-160 competitions since then and is a Master Class Open shooter. Uspsa 3 gun is Cesar’s favorite competition to shoot in. Cesar’s advice to new shooters is simply to have fun! His favorite gun setup is an Akai 38SC build on a PT frame and PT Evo Grip. If he’s not at the range he’ll be on the lake.